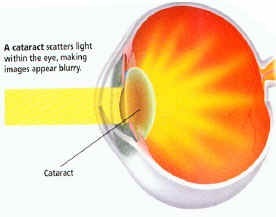 A cataract is when the natural lens of the human eye becomes cloudy or hazy. Usually cataracts develop in the older segment of the population because the lens of the eye is a living structure and also ages. There are various types of clouding of the lens. When the entire lens becomes yellow-brown in color, the term nuclear sclerotic cataract is used. If spoke-like lines develop, the term cortical cataract is used. When a small patch of haze develops on the central posterior part of the lens, the term posterior subcapsular cataract is used. Various combinations can occur together. Other types of opacities, spots, flecks, and discolorations can occur in the lens, each with its accompanying descriptive term. Cataracts are not only an isolated problem of the elderly, they can occur in newborns, children, young adults, too. Various insults can cause the formation of cataracts, including x-ray or radiation exposure, ultraviolet light, medicines, toxic chemicals, infections, inflammation, trauma. Birth problems or developmental problems of the eye can lead to cataract formation. Cataracts can cause unique visual difficulties, depending on the type. When the natural lens is clear light rays pass through it and become focused on the back of the eye. 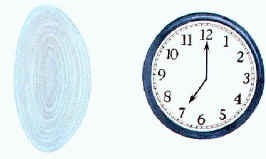 Here is an example of a view of a clock through a clear lens. When the natural lens becomes cloudy and hard the light rays become scattered. 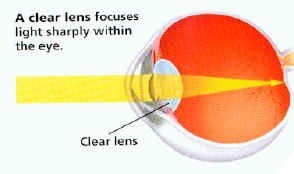 Much of the focus is lost or distorted, resulting in decreased vision. Usually a patient may complain that their vision is foggy, blurry, hazy, or smokey. Colors may seem washed out. They may experience glare or halos around bright lights. Activities of daily living may be more difficult to accomplish such as reading books, labels, instructions, seeing signs, driving, sewing, computer work. 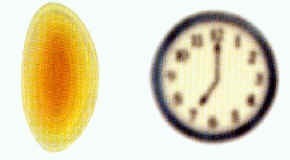 This is an example of a view of a clock through a cloudy hard lens. Is this happening to you? Sometimes a cataract may cause other severe vision threatening conditions such as a form of glaucoma. Cataracts are diagnosed at the time of a complete eye examination. The decision to remove a cataract occurs when the patient’s vision is not adequate enough to safely do activities of daily living and Dr. Gualtieri has made certain no other conditions are responsible for the decreased vision. Today modern "no-stitch" cataract surgery is a reality. 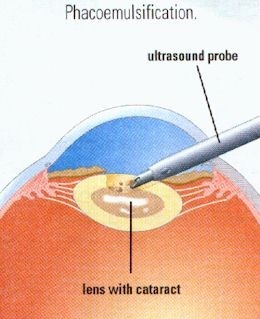 Cataracts can be removed on an outpatient basis by a skilled surgeon and microsurgical computer controlled instruments. The surgery time (personally done by Dr. Gualtieri) is about 30 minutes. The entire out-patient surgery block of time is 3 hours because there is a hour before for preparation and an hour after for light recovery & observation. You will go home with a small patch over the eye and returning to normal activities immediately after surgery is possible ! 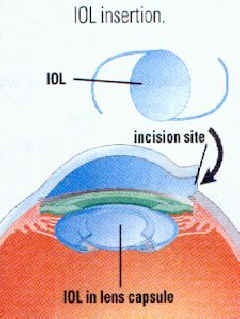 The actual surgery consists of first numbing the eye with topical anesthetic drops. Then a small 3-mm incision is made. Through this incision, an instrument called a phacoemulsification ultrasound probe. The probe is a hollow tube, which vibrates with ultrasound and emulsifies and vacuums out the cataract. A new flexible clear plastic lens implant is placed though the incision and positioned inside the clear capsule "bag" that remains after the cataract is removed. The incision is self-sealing so stitches are not needed. 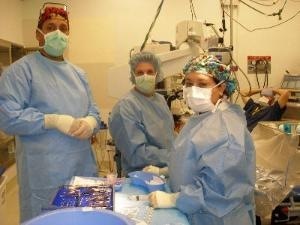 The patient leaves the operating room with new better vision and new found independence. The surgery time is about 30 minutes. The entire out-patient surgery block of time is 3 hours because there is a hour before for preparation and an hour after for light recovery & observation. You will go home with a small patch over the eye and return to normal activities as tolerated immediately! There are a multitue of implantable lenses for the eye. Dr. Gualtieri will chose the best one for your eye. Monofocal (Softec HD, Hoya, Acrysof) lenses give great distance vision. Reading glasses are requires for near vision tasks. Multifocal lenses (ReStor, ReZoom, Tecnis, Crystalens) give great distance, intermediate, and near vision. 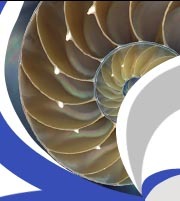 Toric lenses (Staar toric, Alcon toric) correct astigmatism and provided great distance vision. Reading glasses are required for near vision tasks. If you have any of the symptoms of cataracts, DO NOT DELAY, call our office immediately at 619-688-2648 for a cataract evaluation and get back that vision you deserve! 2. Surgery day. You will usually arrive at the surgery center 1 hour before the surgery to be prepped. You will be dressed in a gown, connected to vital sign monitor, and receive, pre-operative eye drops. Dr. Gualtieri and the anesthesiologist will visit with you before starting the case. The procedure will last about 30 minutes. You will be awake but sleepy and very comfortable. After the operation, you will go to a recovery area for a final check, then home to start your eye medications. 3. Post operative day one. You will return to the office for an exam. Dr. Gualtieri will examine the eye to make sure it is healing in a proper fashion. 4. Post-operative day 7. You will return to the office for an exam. Dr. Gualtieri will examine the eye to make sure it is healing in a proper fashion. Medication types and dosing will be adjusted. 5. Post-operative day 30. You will return to the office for an exam. Dr. Gualtieri will examine the eye to make sure it has completely healed. Your eyeglass prescription will be adjusted.